The Dominion Theatre is the venue for a show that's set to rock your world. If you love Meat Loaf's unique musical style in all its humorous, loud and proud glory, you'll never forget this particularly big night out. 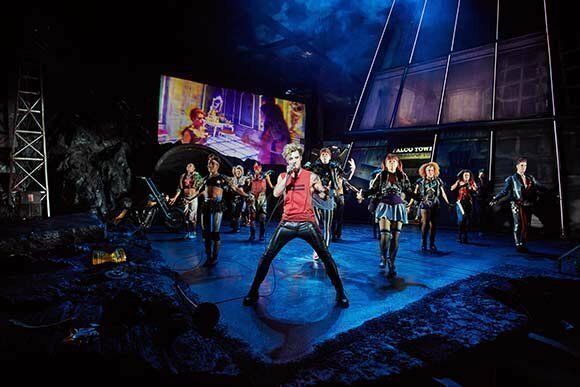 Bat Out of Hell features more than twenty massive songs from the Loaf, set to a plot that'll have your heart racing ten to the dozen. Huge fun, eagerly anticipated, don't miss it! 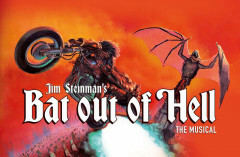 Bat Out Of Hell is inspired by the albums of the same name, with tunes by the brilliant songwriter Jim Steinman and Jay Scheib at the helm. 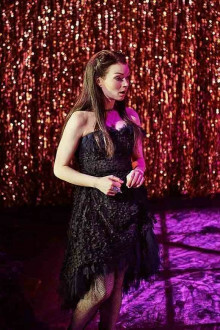 It's no surprise it has made it to the stage, joining a host of music industry stars whose songs have been immortalised in top class musicals. In a way it's surprising it took so long for Steinman and Meatloafs' extraordinary rock opera to make it to the stage. 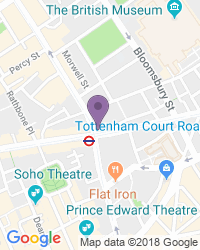 It's been on Steinman's mind for some time, by all accounts, so it's fantastic to finally see it on the way to the West End. Expect twenty or more classics from the Loaf, woven into a story you'll revel in. Are you ready to rock? The story goes like this: young Strat is stuck in a post-apocalyptic world and he'd do anything for love. Being madly passionate about the mad dictator Falco's daughter is a risky business – will romance win the day? 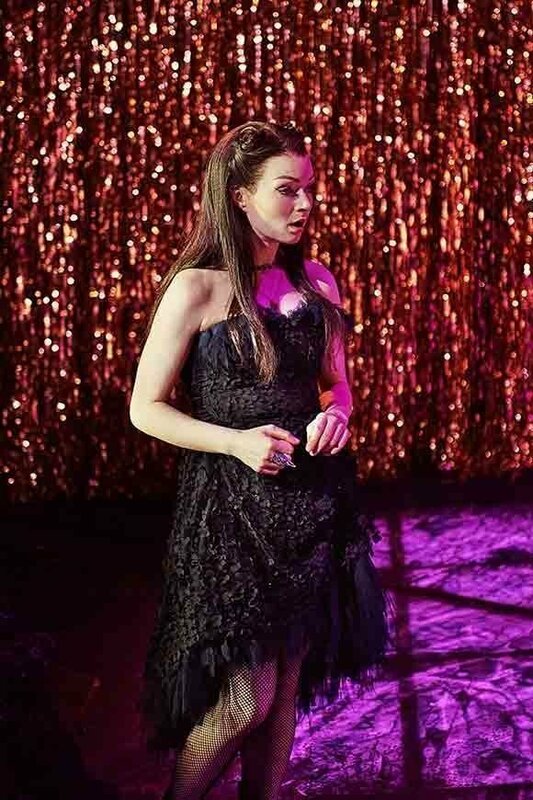 The musical knits together classic tunes from all three Bat Out of Hell albums, a plot that does full justice to the music's power, drama and massive electric charge. Expect plenty of singing and dancing to spice up the action, and plenty of humour too – a staple of the personality behind the music. By all account Meat Loaf is a very funny man, and while the fine details of this hit-in-the-making of a musical are yet to be revealed, the signs are looking good. Very good. Best of all, the word on the streets is there'll be a few brand new Steinman songs to add to the classics we all know and love. If your idea of a great night out includes top music plus themes of love and loss, you've got it. There might even be the occasional motorbike on stage. You'll have to wait and see! 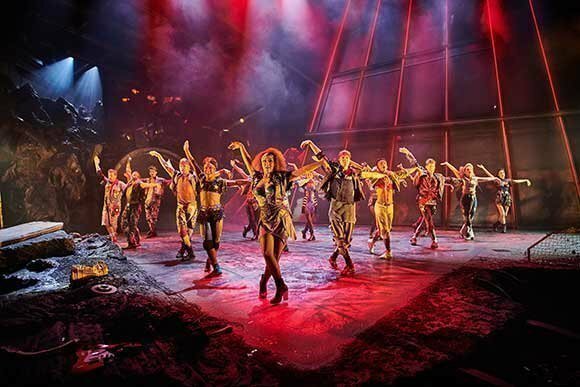 Want premium, full price or discount Bat Out of Hell tickets? We always have great availability and you'll enjoy excellent value for money on the full range of ticket types and seats, low cost to the best in the house. A show never to be walked on by. Have seen this show three times, each time i was left in the same place, when can i buy a ticket to see it again? Very sad to see the last performance but know the beat will live forever via You Tube. The music, singing and band were top class. Lots of surprises, and although we may have got used to these being Meatloaf songs, it didn't matter who sang them, male or female. I saw this 6 times so you can see I LOVED IT. Amazing show, cast and energy! Fantastic show. Shame it's the last one. If you like Meatloaf and Jim Steinman you'll love it. But even if not I think you could be fan by the end of the show. Just a shame it ends today. Let's hope they bring it back with the same lead cast. Thank goodness it is finishing tomorrow!! Have no dislikes about the show or theatre at all. Loved every minute of it!! Strong show but very good. Probably not recommended for children. Fantastic set and lighting, slick scene changes and excellent effects. Imaginative choreography. Music to give you goosebumps. Not to be missed. Awesome show, one of the best I’ve seen! Absolutely fantastic show, fabulous music .. great story. Enjoyed the few funny bits .. highly recommended. So much energy, so much emotion. This was our second time to see Bat out of Hell and it was just as good second time round we took our Friends who were pleasantly suprised with the quality of the production well done to everyone concerned. The show was excellent as it held you in suspense as to what would happen. We had a seat in the front stalls which we thought was a very good seat as you felt part of the show. I did not feel that this show would be a good idea for young children. If you like rock music, it’s a must see! Great show kept me entertained from start to finish, great vocalists. I would highly recommend seeing it before it ends. I attended the Bat Out of Hell show on December 19th 2018 with my wife, having already seen the production with my daughter in August. I simply HAD to bring my wife up from Brighton to see the show and could barely wait for her to see it over those four months. Fantastic vocal performances by all principle characters, great stage production, wonderful musical direction and so very moving that we were both reduced to tears during and even after the show. I cannot recommend this show highly enough and thank Jim Steinman for the incredible music which inspired it. The lighting and sounds effect were amazing, created an amazing effect. The whole show in general is really worth the watch! Amazing! there's no story! the cast can sing and all seem to be trying their hardest, but the music is terrible, story-line is non-existent and the acting awful. We left at the interval. Wow, the singing and the music was incredible - the live orchestra amazing. Although the story is a little cheesy I think quite a clever weaving together of the Meat Loaf songs where they all make sense within the storyline: clever writing. The singing was incredible. How these performers so this every night or even more is just crazy. Go see it before it goes off. Such a shame it is finishing. Maybe it was put into a theatre that was too big. It is a great theatre and I hope it gets put on to a smaller one somewhere else or what a waste! The old Meatloaf songs are good. The story line I was not sure about, stage and set were very good. I love it so much. Been 5 times. Devastated it's closing. Don't know what i will do now!!!! Absolutely fantastic, the songs brought to life in a new way , goose bumps throughout. Special effects were spectacular, music and songs were fantastic. Highly recommend!! Loads of energy. Incredible and very clever staging - very atmospheric. Great singing (although don’t expect it to sound like MeatLoaf). Not much of a story but it really didn’t matter. A must see show amazing ! The show was amazing cant say enough about spectacular lighting & effects , the cast are brilliant actors with amazing voices , my second time seeing it ! An attack on your emotions! Fanbloodytastic!!!! The best musical score ever to hit the West End stage. Astonishingly beautiful. End to end incredible music. Seen it 3 times and the cast continue to give it 110% every time. Catch it while you can. Please don’t expect to enjoy the show, don’t sing along or move or even look as if you might smile. The show is only for people who don’t have any personality. Fistly, a fantastic evenings entertainment. Not what you might expect as the performance is loosely based on Peter and Wendy / Lost Boys, it incorporates the music of Meat Loaf. Dual cameras included in the performance adds to the visuals, and the 3D, (although sparse) is excellent. Seats L2/L3 Stalls, advertised as non restricted view, was in fact restricted to anything on the far right of stage. Tremendous original set and a very young energetic and talented caste. Feel good show. Really enthusiastic cast. Loved it. Lovely theatre but it was very cool at the start as the air con was on. Seen the show rwice. Row F circle provides perfect view. This is the best musical by far. What an amazing show! Full of amazing singers, musicians and actors. Would definitely recommend this to anyone! Really great show best ever. Brilliant show love it. A must see for Bat fans. Seen three tunes now, upbeat show leaving you with a great feeling when you leave. Seen once with main cast members and twice with understudies, loved the main characters and would have liked to see them again but certainly did not spoil anything with the understudies. have seen this show for three years running at least twice a year & each time there are slight differences so makes it fresh each time. cast are so believable & music & stage changes are really good. there are a few flashing light times. Unfortunately our experience was spoilt by a number of drunks sitting two rows in front of us. Came with open mind! Enjoyed every moment!! Heavenly, Hell of a show. I was told there would be newspaper on the seat explaining the back story but there weren’t any. Having said that we soon picked up the plot although the music was the most important item. Seen this twice, second time was a singalong and what a great party there was with a wonderful atmosphere and everyone joining in with the classics. The show is brilliantly staged, sound is fantastic and all the performances excellent. If you are a Steinman fan don't miss this treat. For me this is 'west side story' set in 2025 so should appeal to anyone who enjoys brilliant singing, excellent acting and an exceptional storyline. 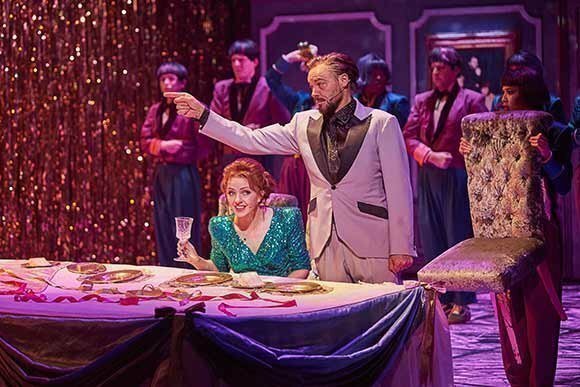 Do not be put off if there are 'understudy or stand ins' everyone in this troupe gives heart and soul to the performance, being a newbie I have only seen it 20 times from the early days in Manchester through the Colosseum to the Dominion. Don't prevaricate - book those tickets now before the show ends and enjoy. Best show we’ve ever seen. The whole cast in this production have the most powerful voices I have ever heard. Each time I see this show I like it more and more. Amazing show. Great view in all seats due to the stage setup. See it if you like Meatloaf music! Everything I want from a play is Bat Out of Hell. Awesome music, dancing, acting and special effects! 100% must-see for Meatloaf/Jim Steinman fans. The songs are great anyway, but are really brought to life in the musical. Stunning. I wouldn’t recommend it for under16’s because if the sexual contents. An amazing production with an energetic lively cast. Back for a second time! Sitting close to the stage gave a different perspective and appreciation of the back ground action and dancing. Some amazing special effects and very interesting use of the stage, being multi level. Took older teens who loved the show. This show is wonderful for anyone who loves the Meatloaf soundtrack. It is also a love story which has been cleverly written to incorporate all the well known tracks from the Bat out of Hell compilation. Amusing aswell and aimed at an adult audience. Really enjoyed show. Music was good by the orchestra and the singing was good too. Story line very simple basic. But show was mostly about the music so does not matter. We really enjoyed it and would recommend people seeing it. Does contain strobe lighting so they should warn people in case anyone has epilepsy for example. I did not have any expectations which was good as it blew me away! Cant help but sing along to the songs and had great energy and vibe! Generally really fun exciting show with quite a lot of comedy aspects too which was great! 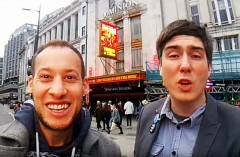 The Break A Leggers review Jim Steinman’s Bat Out of Hell The Musical at the Dominion Theatre in London’s West End. Will it be Break A Leg? Or Leg It! The full casting has been announced for BAT OUT OF HELL heading to the London Coliseum next June and I'm very excited about the line up. 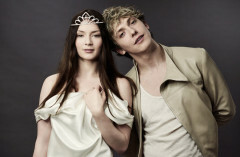 The casting is daring and imaginative and it’s going to introduce a lot of people to some hot new talent. It’s been a long time coming but now finally everything’s in place and it’s been announced that Meatloaf’s most theatrical of albums, BAT OF OUT HELL, will be the basis of a new stage musical, to be staged by Obie Award-winning director Jay Scheib. The music and lyrics were written by Jim Steinman and the songs on the best selling trilogy of albums performed by Meat Loaf have always had a story linking them together. Use the search box at the top left of this page to search for Bat Out of Hell tickets availability.